Eating and drinking Jesus’ Body and Blood means we draw life from the Lord. That life is drawn from the spiritual reality miraculously made present through the words of consecration where the Lord himself, through the agency of the priest, makes present his Body and Blood. Catholics believe that Jesus Christ is really, truly, and substantially present in the Eucharist. There are many stories of miracles throughout history that seem to confirm this important teaching. We head of the 8th century miracle of Lanciano last week where the congregation saw the bread and wine transform into real human flesh and blood. Similarly, in the 13th century a priest who had been experiencing doubts about transubstantiation was celebrating mass in Orvieto, Italy. Soon after he had consecrated the Eucharist, the host started bleeding onto the corporal. The corporal remains on display in the Cathedral of Orvieto. Then there is the miraculous preservation of stolen consecrated hosts that were discarded because the thief only wanted the gold ciborium. The hosts were too dirty to be consumed and now, 285 years later, they can still be seen in the Basilica of St. Francis in Siena, Italy. 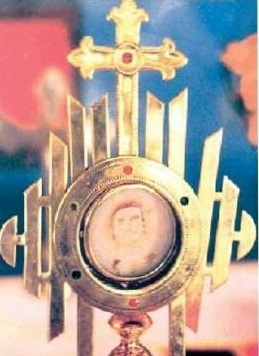 In 2001, there was Eucharistic adoration at a parish in India when suddenly three red stains materialized on the host that had arranged themselves to look like the face of a Jesus. In the 13th Century a woman in Portugal went to Mass to steal a consecrated host. She received the Eucharist on her tongue, removed the Eucharist from her mouth, wrapped it in her veil, and headed to the door of the church. But before she got out, the host began to bleed. She put the host in trunk from which emanated a light that night. Regarding the last miracles concerning bleeding hosts I can confirm about I have seen a bleeding medal in 1994 in Webley. It was of the Holy Face. Also, I know of light emanating from the Family of Mary mission chapel in Gagarina, just outside of Moscow. I stayed there one summer. In 2008 during the Liturgy of the Mass in the eastern Polish town of Sokolka, a consecrated host was accidentally dropped on the floor by the priest. It was then carefully placed in water in order to allow it to dissolve. However, several days later a nun discovered that the host remained undissolved and she also noticed a distinctive red mark on it. Two medical doctors determined that the spot was heart muscle tissue. "The histopathological tissue fragments were found containing a fragmented part of the skeletal muscle. ... The whole image ... is most similar to the heart muscle ... as it appears under the strains of agony. Genetic studies indicate the origin as human tissue." In 1996, a woman approached a priest in a Buenos Aires parish to say she had found a desecrated Host in a candleholder at the back of the church. When the priest put the Host in a glass of water to dissolve, it appeared to turn into a piece of bloody flesh. Three years later, after the flesh had not decomposed, a certain Bishop Jorge Bergoglio sent a sample for testing in California. The results came back that the blood was group AB and was indeed human. Just a few stories, some more compelling than others. Together they spell out the truth about what we believe as Catholics. The Body and Blood we receive in communion is the flesh and blood of the Son of Man that gives us eternal life.